A subregional platform has now been established to assist communities in the implementation of the Flood Vulnerability Reduction and Early Warning Systems Project for Small River Basins in Central America. The Platform will provide training and technical assistance to mostly poor rural Central American communities so they can play the leading role in reducing their own vulnerability to flood-related hazards. An initiative of the Natural Hazards Project of the Organization of American States Unit for Sustainable development and Environment (OAS-USDE), the Flood Vulnerability Reduction Project facilitates mitigation in river basin communities that would normally be bypassed by national disaster reduction policies, since they are located far away from major cities and do not boast hydroelectric dams or large-scale agro-industrial investments. The FVR Project also makes it possible for early warning systems to be set up, and encourages community organization to respond effectively to water-related hazards. In Honduras, for instance, several pilot interventions have been successfully carried out that are being duplicated elsewhere. The interdisciplinary Project, which dates back to 1995, brings together a variety of institutions from different sectors in order to keep watch over those atmospheric and meteorological events that, in conjunction with man-made changes to the environment, are known to cause catastrophic floods. Long-term climate variations that pose a long-term risk to the sustainable development of small river basins are also a subject of study and planning. Financial support throughout has come from the International Institute for Infrastructural Hydraulic and Environmental Engineering (IHE), based in Delft, The Netherlands, which acts as the International Secretariat of the Dialogue on Water and Climate (DWC). The Central American chapter of DWC is coordinated by USDE and the Regional Committee on the Water Resources of the Central American Isthmus (CRRH). Six stages comprise the Project, all but the last of which have been completed. Stages One through Five were funded by the European Commission Humanitarian Office (ECHO) and the government of Ireland. 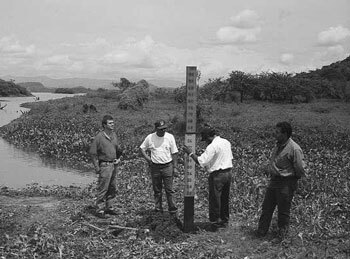 Their focus was on basic methods for community-centred vulnerability reduction, including pilot projects in one small river basin in each of the Central American countries in order to test the validity of these methods. In addition, training was provided to participating professionals in such fields as vulnerability assessment, mitigation planning, hydrological analysis, and flood monitoring and forecasting. While community involvement has been a constant of the Project, partly due to a series of awareness-raising and motivational campaigns, it is only now, with Stage Six and the establishment of the Subregional Platform, that grassroots participation will kick into high gear. So far, two workshops have been held to promote the involvement of Central American civil society. The first brought together national, regional and international NGOs, multilateral and bilateral agencies and local stakeholders to determine how a consortium of non-governmental organizationsyet to be namedcould assume responsibility for the development of the platform. The local communities. Since it is local communities that are most directly affected by floods and other natural disasters, the platform will provide them with the training and technical assistance they need to reduce their vulnerability. NGO involvement. 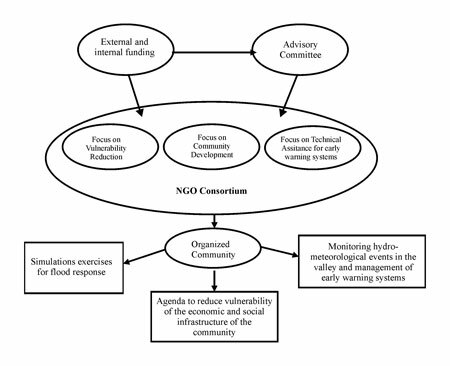 The NGO Consortium that will finally be selected will be responsible for facilitating vulnerability assessments, maintaining up-to-date risk maps, developing community education programmes in disaster reduction and mitigation, and training local residents in community self-management techniques. The Advisory Committee. The Advisory Committee will include representatives of multilateral organizations such as the OAS, national emergency commissions, universities and research institutes, the private sector, NGOs and volunteer groups. Their job will be to oversee the successful implementation of the Platform and publicize the results at the international level, as a unique Central American contribution to global disaster reduction efforts. Funding. The Platform will cover the costs of providing training and technical assistance for the development of the early warning systems, community emergency response mechanisms, and vulnerability and mitigation assessments. Participating communities will cover their own costs, including the maintenance of the early warning systems once they are in place. Vulnerability reduction requires significant investments in time and money. Many Central American communities are willing, even eager, to reduce their vulnerability and enhance their prospects for sustainable development, but they need training and technical assistance. It is here that the subregional platform of the Flood Vulnerability Reduction and Early Warning Systems Project for Small River Basins in Central America comes inas a deeply practical way of improving the quality of life of participating communities while serving as an example to other developing nations.